This thread is stainless steel making it extremely tarnish resistant. 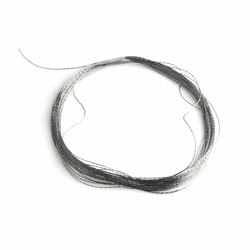 This thread is a 2-ply thread and may be small enough to be compatible with some sewing machines. This thread has a resistance of about 9 Ohms per linear foot and weighs about 0.20 ounces for the full 50 feet.